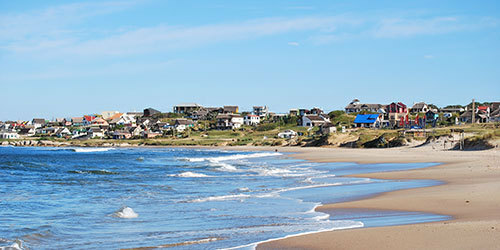 We needed some dinner and inspiration to come up with an idea for our hack, so we took a long walk over sand and rocks, pass the three major beaches, La Viuda, Rivero, Los Botes, and into the small but bustling city center of Punta Del Diablo. It consisted of many colorful bungalows, shops, markets, and bars distributing their wares in Uruguyaun pesos. One thing the graphic designer in me immediately noticed, were the large amount of beer sponsored store signage. I didn’t feel compelled to enter places sponsored by Cerveza Patricia when they were next door to an establishment with a hand-crafted sign. I think Aaron Draplin would agree. Come, come, come! Milenesas! Capachino Caliente! We sought shelter from the audible chaos, and found a nice little cafe called Balvini or some other whiskey, which served small rectangular pizzas and cervesas in liter form only. After a few liters of beer, things got sloppy and I realized something amazing about my new [Field Notes](#) memo pad: they were water proof. Tear-resistent Yupo Synthetic Paper to be exact. This came in handy during sporadic rain spells and consistent self spills. Beer turned to whiskey as day turned to night, and we became friendly with a group of middle aged women as a band began to setup within the cafe. Our waiter joined into the conversation which consisted of a comical bashing of my United States upbringing due to our sometimes ridiculous immigration laws. While I gladly took the blame for everything American in my orange camo hat, Johannes took credit for everything German including the wonderful city of Berlin, which everyone loved to bring up. Our advances with the women were cut short when we were forced to make a dash inside the cafe and lose flirtation proximity due to rain. The night reached a climax when we began to pay more attention to the band which was now sound checking. They went at it for what seemed like hours, and by it, I mean sound checking. The band was led (whether or not the other members approved) by a bass player with extremely rockin hair whom kept wandering the stage and street perfecting all possible acoustics. I’m guessing for the bass part. When the set finally began, he did not disappoint and head banged (bung?) through the entire gig, constantly taking center stage where I recall a single spot light pointed. Our amazement for this nameless bass player turned to inspiration when we agreed to try and build a game that incorporated head banging. We stumbled home to get some rest and prepare for the hack mañana.